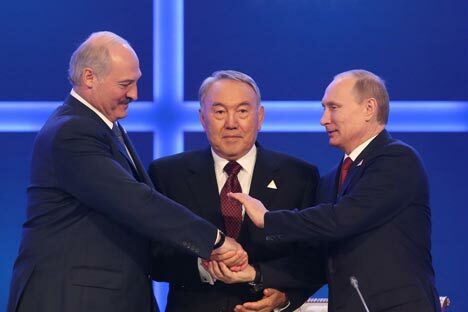 At a ceremony in Astana, the presidents of Russia, Kazakhstan and Belarus – Vladimir Putin, Nursultan Nazarbayev, and Alexander Lukashenko signed a historic agreement setting up the Eurasian Economic Union. The EAEU will start operating on January 1, 2015. Russian experts welcome improved economic efficiency but caution against haste in establishing a single energy market. According to Vladimir Putin, this document takes the three countries to an absolutely new level of integration. “While fully preserving our state sovereignty, we ensure a closer and better coordinated economic cooperation,” he said. Aleksandr Knobel, head of the international trade laboratory at the Gaidar Institute, told Vzglyad, that the EAEU agreement does not create anything new from the economic point of view. Everything that this document sets has already been envisaged within the other associations uniting the three countries. That is why, in the short term, the union will not make it possible to boost trade between the three countries dramatically. All the more since trade between them has been duty-free since 1992, Knobel said. However, in part four of the agreement, the new union creates a basis for finding further compromises and removing the remaining restrictions. The three states undertake obligations to guarantee free movement of goods, services, capitals, and labour. Members of the union will pursue a coordinated policy in the key sectors of the economy: energy, industrial production, agriculture, and transport. Part four of the document sets out further agreements on the commodities and financial markets and their timeframe, Knobel said. For example, by 2025, a common financial mega-regulator should be created and the signatories to the agreement should arrive at a common macroeconomic, antimonopoly, foreign currency, and financial policy. In 11 years' time the member states should set up a common oil and gas market. By 2019, Russia, Kazakhstan and Belarus intend to create a common electricity market, while a single pharmaceutical market should start operating from Jan. 1, 2016. The creation of common markets in different sectors not only means free movement of goods inside the EAEU, but also a harmonization of rules and tariffs on the three countries' markets. With regards to electricity, at the moment Russia exports it to Belarus and Kazakhstan and imports it from Kazakhstan. “We have lower electricity tariffs for domestic manufacturers, so it is natural that the EAEU partners would like them too. This is their interest,” Knobel said. Kazakhstan and Belarus are also trying to get access to Russian oil and gas resources, although their interests here are different, deputy head of the National Energy Security Fund Aleksey Grivach told Vzglyad. Russian oil supplies to Belarus are exempt from duties, however Minsk has to pay an export duty to the Russian budget from sales of petroleum products (made from Russian oil) to Europe (and third countries outside the Customs Union). Kazakhstan too would like to buy Russian oil at domestic Russian prices. It is also interested in using the infrastructure on Russian territory and exporting gas to Europe independently, said Aleksey Grivach. That was why Russia insisted on a lengthy period of transition towards a single energy market so that it does not end up losing money and opportunities and getting a competitor on the European market to boot. Whereas in 11 years' time, energy prices inside Russia may become closer to export prices, the European market may no longer be so significant for Gazprom, and Kazakhstan may no longer have superfluous gas to export to the EU. The mutual benefit of the integration processes of Russia, Belarus, and Kazakhstan is already becoming evident. The three countries' economic ties have already expanded, the trade structure is improving, the share of high-tech goods in the overall structure is rising, the countries' competitive ability is improving. Over the past three years, trade inside the Customs Union has risen by nearly 50 percent, or by $23 billion (with the 2013 results taken into account, it has reached $66.2 billion). Taken together, Belarus and Kazakhstan have become Russia's third largest trading partner after the EU and China. Now further economic efficiency from integration lies in the elimination of non-tariff barriers, Aleksandr Knobel of the Gaidar Institute said. The EAEU also offers more opportunities for integration with third countries outside the union. As President Putin pointed out, the members of the new union have agreed to step up talks with Vietnam on creating a free-trade zone, to strengthen cooperation with China, including in information exchange on goods and services, and to set up expert groups to develop preferential trade regimes with Israel and India.